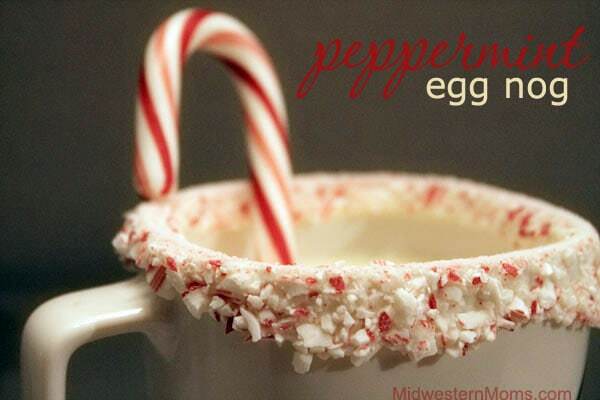 Whether you like to make your own egg nog, or purchase it in the store, you can still add a little peppermint to heighten the flavors! We love this drink at our house and the chocolate peppermint rimmed mugs make it even more fun to drink! This recipe was adapted from the Peppermint Eggnog recipe on the Martha Stewart website. Step 1: In a large bowl, whisk together eggs, egg yolk, sugar, vanilla and peppermint extract. Pour into a medium saucepan and heat on medium high for about 5 minutes. Step 2: Pour milk into saucepan and whisk into the mixture. Turn up the heat and cook until thick. Step 3: Remove from heat and let cool (or place in the refrigerator to speed up the process). Step 4: Once you are ready to drink, mix with the cream by putting it in your mixer. Step 5: Heat almond bark in 30 second increments in the microwave until it is melter. While doing this, place 2 candy canes in a plastic bag and crush using a rolling pin. Place the crushed candy canes into a deep bowl or onto a plate. Step 6: Dip your mug into the almond bark and then dip directly into the crushed peppermint to coat the sides of your mug. 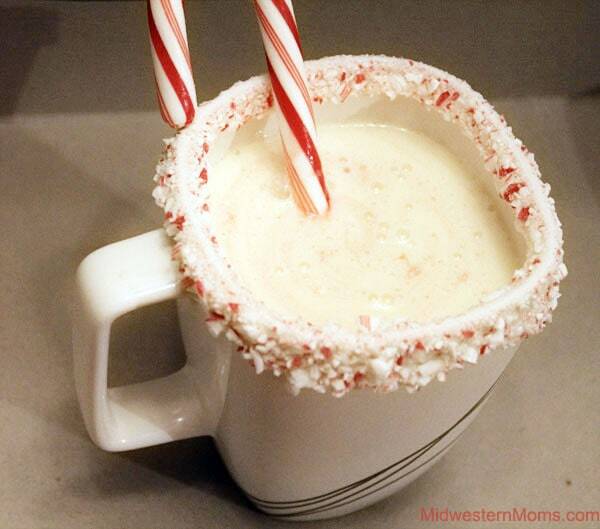 Pour the eggnog into your cup and garnish using a whole candy cane. For some crafty goodness today, be sure to stop by Thrifty Ninja’s blog to learn how to make a peppermint pom pom wreath!